This report is prepared pursuant to the Environmental, Social and Governance Reporting Guideline (the "Guideline") in Appendix 27 to the Rules Governing the Listing of Securities (the "Listing Rules") on The Stock Exchange of Hong Kong Limited (the "Stock Exchange"). This report covered the key performance indicators in respect of environmental protection of the Company from 1 January 2017 to 31 December 2017, which were mainly based on the data provided by the Company and certain large-scale subsidiaries. There is no significant change in the scope of this report from that of the 2016 Environmental, Social and Governance Report. This report has complied with all the "comply or explain" provisions as set out in the Guideline. We did not disclose certain key performance indicators which are required to be disclosed by the Stock Exchange but not directly related to the business of the Group or have minimal influence. The Group is a leading services provider in the PRC informatization sector which is committed to providing integrated comprehensive solutions to customers and consistently upholds its principle of "customer oriented, outstanding performance, efficient resources allocation and innovative leadership". On the back of our fundamental missions of serving our customers, bringing returns to our shareholders, caring about our employees and giving back to society, we devote ourselves to providing a series of services covering high-quality, efficient and secured telecommunications infrastructure services, business process outsourcing services and applications, content and other services. 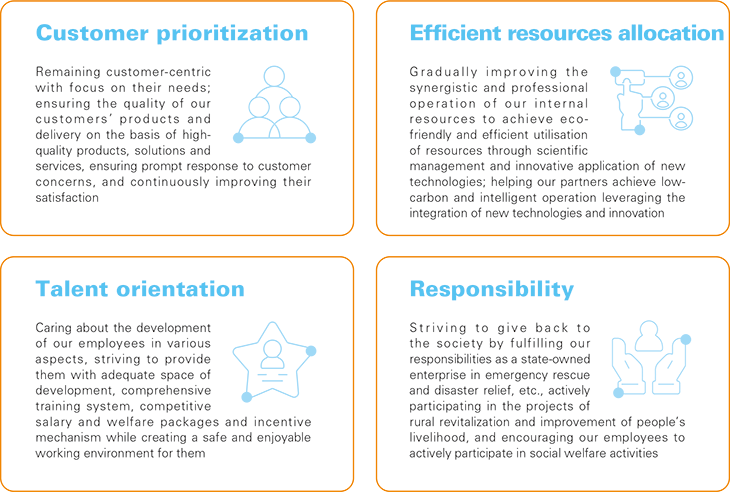 We place a strong emphasis on scientific development and corporate social responsibility, deliver value to our customers and the society, promote sustainable development, and align our corporate development with society and environment. While focusing on maximizing the economic interests of its shareholders as a whole, the Group shows sincere care about the common interests of its stakeholders including its customers, employees and the public, in order to achieve a healthy, sustainable and harmonious development. We have conducted an in-depth research on our stakeholders' concerns, attached great importance to communication with them and actively responded to their advice; we convert their reasonable requests as the Company's targets, and endeavour to meet expectations and requirements of various parties. As a communications services enterprise, the Group has always complied with relevant national laws, regulations and standards on emission during the course of service provision. We have established an internal management system, and embarked on energy saving and consumption reduction activities to ensure that we can meet our energy conservation and emission reduction goals. In 2017, the total energy consumption of the Group was approximately 142 thousand tons of standard coal (2016: approximately 141 thousand tons of standard coal). According to the energy report of the Group, the emission of greenhouse gases arising from energy consumption of the Group in 2017 pursuant to the Greenhouse Gas Protocol was approximately 377.8 thousand tons (2016: approximately 374.7 thousand tons). As for water consumption, the Group's water supply is provided by the owner or property manager of the office building, thus the Group does not have direct control over the water consumption. However, we have been striving to raise our employees' awareness of water conservation by posting notices and regular public service announcements. The Group consistently adheres to the philosophy of environmental protection throughout the entire course of communications service provision, and complies with the relevant national laws, regulations and operational standards on environmental protection. In exploring, designing and constructing field area communications, we keep away from mines, forests, grassland, wild animals' habitats, natural and human heritage, nature preservation areas and scenic areas as far as possible. In the event we have to undertake minor alterations to the natural environment due to project requirements, we will conduct environmental rehabilitation as soon as possible. We proactively promote cost saving and efficiency enhancement through adoption of new-generation energy saving products and enhancing relevant management systems, and lower our costs effectively. We also widely utilise energy saving lights in our production facilities and offices, appropriately adjust the temperature in our production facilities and offices, encourage all employees to save paper, water and power, and thereby create the environment to build up an "energy saving enterprise" and make due contributions to building an energy saving society. The Group also actively facilitates energy saving and emission reduction for its customers and other sectors in the society. In particular, we have developed and adopted new energy saving technologies in our construction services, property management and logistics operations, effectively assisted our customers to realise construction and operation with low energy consumption, and thereby promoted energy saving and emission reduction in the society. The Group operates in the communication service industry and is mainly engaged in engineering design, construction and supervision, IT infrastructure management services, etc. There is no substantial usage of packaging materials in the course of production and operation. The Group had 99 thousand employees as at 31 December 2017. We are committed to ensuring equal employment opportunities and protecting the rights of female employees. Our employees are located primarily in the PRC with certain located in the other districts such as Africa and Southeast Asia. Our employees are divided into contract employees, dispatched employees, part-time employees and other employees. As a state-owned enterprise, the Group plays an important role in stabilizing employment in our society by providing numerous job positions every year, which significantly contributes to attracting talents and resolving employment issue of graduates. As a leading service provider which provides telecommunications infrastructure services, business process outsourcing services and applications, content and other services to telecommunications operators, government authorities and other business units nationwide, the Group is related to various enterprises in upstream and downstream sectors. As such, the Group not only offers a number of job positions, but also encourages the upstream and downstream enterprises to provide more job opportunities, which have significantly stabilised the employment in the society. The Group helps its employees to enhance personal capabilities and raise social value of by offering trainings and exercises on their skills and management expertise. Meanwhile, the Group actively responded to the call of the government of "mass entrepreneurship and innovation", and for employees who are ambitious in setting up their own businesses, the Group treated them with favourable policies, thus releasing a large group of innovative and entrepreneurial talents for social development. We have actively refined our employment structure in accordance with the relevant national labour management laws and regulations. The Group implements strict recruitment and employment policies and has not been involved in child or forced labour. We consider our employees as an important resource, attach much importance to safeguarding their interests. We have various internally equitable and externally competitive remuneration system in place to cater for different positions and pay the relevant insurance for our employees. We have established a corporate annuity mechanism. We have complied with applicable laws and regulations regarding dismissal, working hours and antidiscrimination, and our employees are entitled to national statutory holidays. We are committed to the career development of our employees and offer dual promotion paths for them - promotion for management functions and promotion for technical expertise. We implement a system that links our employees' remuneration and promotion to their work experience, capabilities and performance, which incentivises their proactivity. The Group attaches great importance to the professional skill and expertise development of its employees. We made noticeable efforts to cultivate, discover and publicize outstanding individuals and teams within the Group in 2017 to inspire employees with the enterprise value of advancement, innovation and responsibilities, ultimately making a greater contribution to the development and expansion of the Group. During the year, the Group organized a voting for innovative achievements by its employees, with a total of 821 accomplishments emerging as the final winners. The Group also held its second Comprehensive Maintenance Techniques Competition - "Comservice Craftsmanship", with 15 professional workers and technicians accoladed. We attach great importance to trainings and have established a three-tier training system covering the headquarters, provincial companies and professional companies. By leveraging the advantageous strengths of colleges and training centers under the Company, the Group strives to build a categorized and centralized training system with high efficiency so as to become a learning organization. 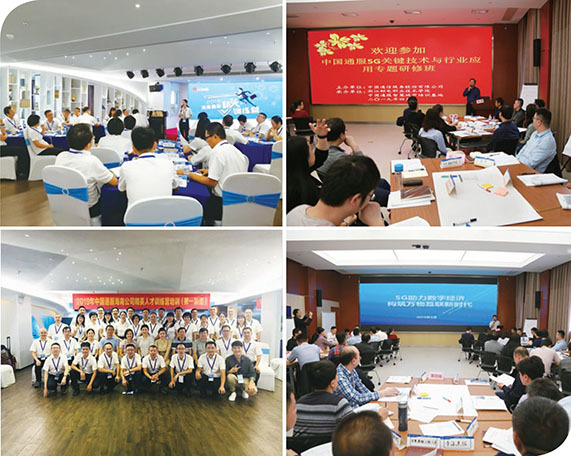 In 2017, the Group organized a training programme named the "China Comservice Pioneer Training Camp for Non-telecom Operator Business", and 71 business managers from the non-telecom operator customer segments of the provincial companies participated the training camp. Such training enhanced their comprehension of strategies, coordinated marketing abilities and efficient execution capability. In 2017, the Group also organized a training programme named "China Comservice Leaders Training Camp", with the participation of 83 management reserves from provincial companies. They analysed industry trends through strategic decoding and seminars with the General Managers, etc. The training improved the comprehensive capability of management reserves and built up a strategic talent pool for the future development of the Group. 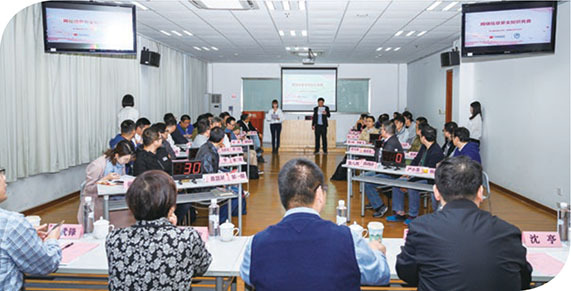 The Group organized "China Comservice Pioneer Training Camp for Non-telecom Operator Business"
Each year, we conduct two-way exchanges between employees in the headquarters and the provincial companies, and hold periodic training seminars on leadership for the exchange employees and the management. We attach importance to the selection and recommendation of management reserves and have gradually built up an adequate and high-quality team with diverse background and sound structure. 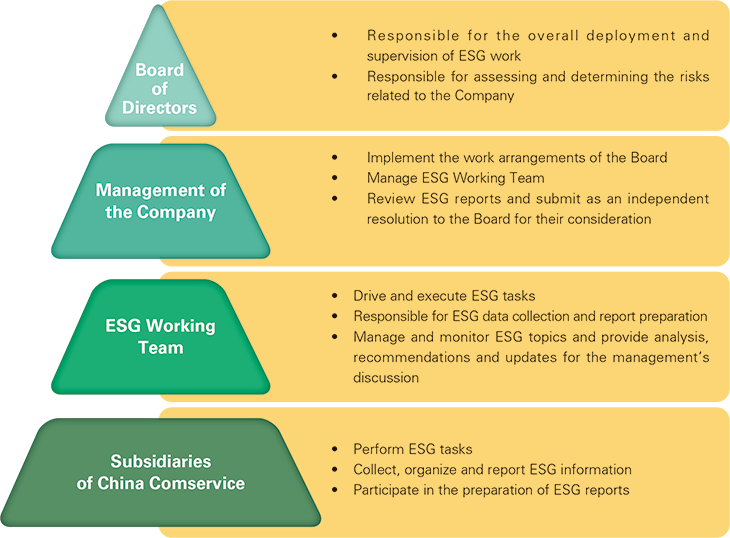 In 2017, the Group issued the "Provisional Measures for the Cross Region Exchange of China Comservice's Management Reserves", and arranged relocation for 13 provincial-level management reserves to different regions with the same position, which further promoted the sharing of human resources and accelerated regional balanced development. The Group is committed to safe production, consistently complies with the requirements of laws and regulations such as the PRC Labour Law, PRC Safe Production Law and PRC Fire Services Law as well as the requirements of the government, and has established a sound work safety management department and safety management rules. The Group launched "Safe Production Month" activities to carry out promotions and trainings on work safety, aiming to continuously raise safety awareness and consciousness of employees in workplace. We organized work safety supervision and inspection within the Group and required all the units to be equipped with a sound safety regulation system, standardized procedures, effective management and strict inspections, with painstaking efforts to eliminate potential safety risks. We fully implemented a work safety accountability system and formulated emergency response and management measures to eliminate safety hazards. In 2017, the Group did not experience any major work safety incident. We have formulated the relevant administrative rules on procurement in compliance with relevant laws and regulations such as the PRC Contract Law and the PRC Tender Law, strengthened the monitoring and control over key procedures of, among other things, contract execution, safety management, financial settlement, monitoring and supervision, and strictly implemented the admission, assessment and exit mechanisms for suppliers. Meanwhile, we conducted trainings on specific skills and safety education to personnel in the supply chain and regulated the management on safe production. The Group has considered business outsourcing as the key area for auditing and supervision. We conducted review on supplier admission, tendering and bidding, outsourcing pricing, signing of outsourcing contracts, materials procurement and settlement of outsourcing costs, with the aim to preventing illegal and non-compliant activities such as violation of the administrative measures of the Company and interests conveyance. During the year, the Company launched a thorough campaign to strengthen its subcontracting business, aiming to eliminate potential risks and ensure a healthy development of the Company through further improvement of the regulation system. The Group is always committed to providing high quality, efficient and safe informatization services for customers and contributing to the improvement of communications infrastructure and the protection of effective communications networks. The Group has complied with applicable laws and regulations in relation to product liability. In 2017, the Group, as the pillar supporting force for the "2017 Global Future Network Development Summit", the "Ninth BRICS Summit" and the "Fourth World Internet Conference (Wuzhen Summit)", successfully implemented and accomplished all the construction and maintenance missions. The Group has participated in the natural disaster relief and telecommunications network restoration during and after major disasters and safety incidents to fulfil our corporate social responsibilities. We assisted in the repair of communications lines to ensure smooth communications network. On 8 August 2017, a 7.0-magnitude earthquake struck Jiuzhaigou County, Aba Prefecture, Sichuan Province, upon which our Sichuan subsidiary set up an emergency command centre and launched the emergency plan, with 249 rescue workers, 62 vehicles and 123 electric generators immediately deployed to the earthquake-stricken area to repair communications lines and guarantee communications network during the disaster. In late August 2017, Typhoon "Hato" and "Pakhar" stroke Guangdong Provinces and Guangxi Zhuang Autonomous Region, leading to the collapse of base stations, impairment to power lines and severe damage to the communication system in numerous areas. In this critical time, our Guangdong subsidiary dispatched 12,000 repair person-times and 2,900 vehicles/times, 575 electric generators as well as various construction equipment to the repairing work, and repaired a total of 5,997 communication failures, including restoring 650 base stations and computer rooms, saving 2,485 power generators of base stations and erecting 1,340 new utility poles. Our Guangxi subsidiary dispatched 1,100 person-times, 600 vehicles/times and 1,000/times electric generators into the rescue work, fixing 130 communication failures, repairing 2 collapsed towers and resuming power supply for 700 times at the base stations. For the whole year of 2017, the Group despatched a total of 19,474 person-times and 7,198 vehicles/times into the disaster rescue work, repaired a total of 34,036 communication facilities and spent 61,445 hours for the rescue work, with our corporate capabilities and commitment to social responsibility fully demonstrated to the public. The Group attaches great importance to the information security and privacy protection of the Company, its employees and customers. 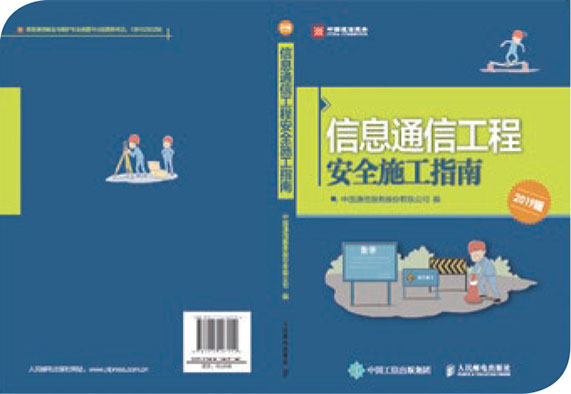 Jiangsu Post & Telecommunications Planning and Design Institute Co., Ltd., a subsidiary of the Group, relied on its independently developed and operated "Comservice Crowd Testing" Security Testing Platform, which has assisted in the test and repairing of loopholes, thereby significantly improving the Group's cybersecurity risk control capabilities. During the year, the Group rolled out trainings on information security and privacy protection and engaged experts to teach classes, which has practically improved its employees' privacy and data protection awareness. The Group also strictly executed the confidentiality clauses under the contracts entered with customers. In the meantime, the Group also enters into confidentiality agreements with its employees based on actual needs. The Group strictly complies with all the laws and regulations in relation to the protection of intellectual property rights, such as the PRC Contract Law, PRC Trademark Law, PRC Patent Law, PRC Copyright Law and PRC Anti- Unfair Competition Law, while continuously enhancing its awareness of intellectual property rights protection and handling and resolving infringement disputes on a timely basis. The Group strengthens trademark supervision to prevent the abuse of registered trademarks; it pays attention to brand protection while promoting the brands and enhancing the value of its brands; it conducts research on intellectual property in respect of the emerging businesses of the Group. The Group organizes law-enforcement seminars at its headquarters from time to time to enhance its employees' awareness of and compliance with relevant laws and regulations and intellectual property rights protection. The Group consistently complies with laws and regulations, social integrity, commercial ethics and industrial standards. We have been devoted to safeguarding the interests of shareholders and creditors and executing contracts in good faith. We honour commercial credibility and oppose improper competition with a view to preventing corruption in business activities. We focus on strengthening anti-corruption and disciplinary education in various ways, such as seminars, training programmes and themed conferences to draw the awareness of our employees on relevant requirements. In addition, we reinforce our daily supervision by combined supervision efforts such as audit and monitoring, and strictly prevent activities such as bribery, blackmail, fraud and money laundering. The Company has established departments in charge of discipline, inspection and supervision at different levels. The Company also strengthened its supervision by hiring full-time and part-time employees and set up a smooth channel for identifying and resolving existing problems in a timely manner. We have attached great importance to the establishment of an anti-corruption system. An accountability system was established to clearly define responsibilities while anti-corruption responsibility letters were signed with the relevant responsible parties. The Company will duly address relevant illegal and non-compliant activities according to the requirements of laws, disciplines and rules, with a view to safeguarding the normal operation of its businesses. During the year, we launched specific corporate governance activities on business of our management team and their relatives which are related to the Group, off-book accounts and construction procurement, which effectively eliminated potential risks and further optimised our prevention system in respect of bribery, blackmail, fraud and money laundering. The Group has established a whistle-blowing mechanism. When business partners and internal employees discover corruption and bribery of the Group's personnel, they can report by real-name or anonymously through the post office box (Beijing, 100033 mailbox 33 bin) or Internet mail. The disciplinary inspection and supervision department of the Company will investigate the report, and the information of the whistleblower will be kept strictly confidential. The Group has proactively assisted the government and society in resolving the employment issue and offered a large number of job opportunities to the public, and contributed to alleviating employment pressure. Whilst accelerating its own development, the Group is devoted to supporting social charity and proactively alleviate poverty by assisting those in need. It also actively participates in charity affairs in education, culture and sports. In 2017, in response to the government's call for poverty alleviation participation, the subsidiaries of the Group carried out poverty relief activities in various forms to demonstrate our responsibility as a state-owned enterprise. Our Qinghai subsidiary actively responded to the guidelines of the central government and organized its staff to go to Dongwei Village, Duowa Town, Tongren County, Huangnan Prefecture, Qinghai Province to provide poverty relief assistance for multiple times. They visited poverty-stricken families, formulated poverty alleviation solutions, provided advice to them and helped them solve problems. Our Jiangsu and Guizhou companies leveraged their technological advantages to achieve precise poverty alleviation, and have undertaken the informatization construction of project of the Qianbei modern logistics cities in Guizhou Province. This project will greatly enhance the logistics level in the northern part of or even the whole Guizhou Province, facilitate the transportation of products out of the mountains, and help boost agricultural output in Guizhou Province and help the farmers increase revenue and lift themselves out of poverty. In December 2017, in order to improve the environment, preserve water and soil, and cultivate rare plants, our Indonesian subsidiary organized their employees to participate in the tree planting activities in mangrove forest organized by the local environmental protection authorities in the BOGOR area. The Group upholds the philosophy of "Dignity within the Company and Respect to Employees" and shows sincere care about its employees. In 2017, the Group set up pantries in office areas, and equipped the office areas with water purifiers and air purifiers, set infant rooms, purchased "Happiness with Mutual Assistance among Female Employees" insurances, and did 2,478 practical favours for employees. During the year, the Group made a total expenditure of RMB17.77 million in building the "Four Small Facilities" such as the "Small Canteens, Small Activity Rooms, Small Restrooms and Small Shower Rooms", with 595 frontline units equipped with the new "Four Small Facilities" and improved and upgraded "Four Small Facilities" in 6,729 units, which delivered our heart-warming efforts precisely. The Group made regular efforts to help people in poverty, ensure students from poverty-stricken families can go to school and keep them warm in winter and cool in summer. It spent a total amount of RMB5.39 million in poverty alleviation and RMB21.92 million in consoling its employees during the year.